MILWAUKEE – (April 10, 2019) – Johnson Controls will soon announce the availability of the LUX KONOzw Smart Hub Thermostat through its DSC channel. This is the first KONO thermostat featuring Z-Wave technology. KONOzw allows users to seamlessly connect DSC security systems, including PowerSeries Neo, iotega and PowerSeries Pro, when combined with SecureNet or Alarm.com interactive services to the smart thermostat through the Z-Wave smart hub. KONOzw offers all the traditional modes of a smart thermostat, including heat & cool and works with forced air, gas, oil and electrical furnaces, giving end users the flexibility they need when choosing a thermostat. It also features universal compatibility with heat pump systems with or without Aux/Emergency heat and hydronic zone valves. KONOzw also provides flexible installation with battery (4 AA batteries included) or C-wire powering options. Its patent-pending interchangeable décor-snap covers enable users to personalize the device – adding individual flair to the thermostat. 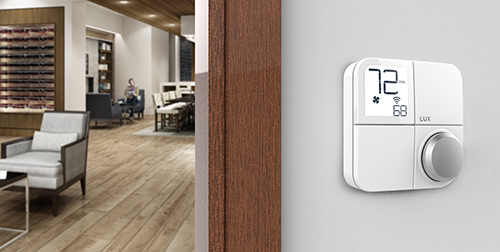 "The integration of KONOzw with Johnson Controls' security systems illustrates the power of the smart home and our broad footprint for bringing innovative solutions to the market," said Rob Munin, general manager of thermostats at Johnson Controls. "The Z-Wave technology opens doors for organizations who want to integrate more functionality into a smart hub to further leverage the capabilities of their smart systems. We believe the KONOzw is an attractive solution for commercial and residential markets." KONOzw will be available for purchase through our North American distribution channels. For more information, visit Pro.LuxProducts.com.